Age Limit (as on 01-04-2019): Minimum 20 years and Maximum 28 years(Check official notification below). Selection Process: Selection of candidates will be made on the basis of preliminary & main examination. Application Fee: General/OBC candidates have to pay Rs. 750/- as exam fee and SC/ST candidates have to pay Rs. 125/- as exam fee through online by using Debit Cards (RuPay/ Visa/ MasterCard/ Maestro), Credit Cards, Internet Banking, IMPS, Cash Cards/ Mobile Wallet). 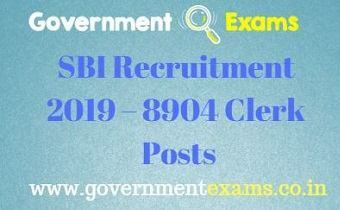 Click here to view official notification: SBI Recruitment 2019 official notification. Click here for online registration: SBI Recruitment 2019 online registration.